^ „Chemainus Theatre Festival - The 2008 Season - Saint Joan - Joan of Arc Historical Timeline”. Chemainustheatrefestival.ca. Архивирано из оригинала на датум 2. 6. 2013. Приступљено 30. 11. 2012. ^ „Charles VI”. Institute of Historical Research. Приступљено 9. 3. 2010. ^ „The Glorious Age of the Dukes of Burgundy”. Burgundy Today. Приступљено 9. 3. 2010. Anon. 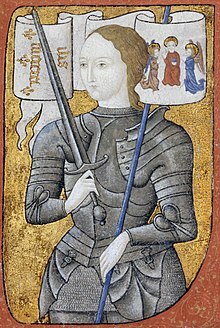 The First Biography of Joan of Arc with the Chronicle Record of a Contemporary Account (PDF). trans. Rankin, Daniel & Quintal, Claire. Архивирано из оригинала (PDF) на датум 9. 7. 2011. Приступљено 30. 3. 2017.